Hooray! 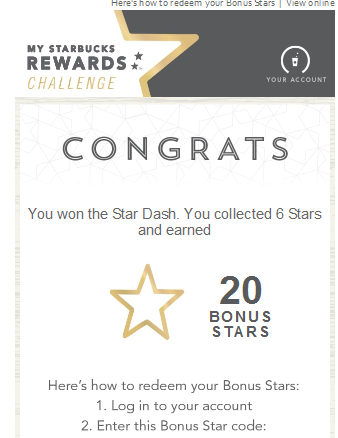 All of that work around the holidays has paid off and my Bonus Stars email has arrived. 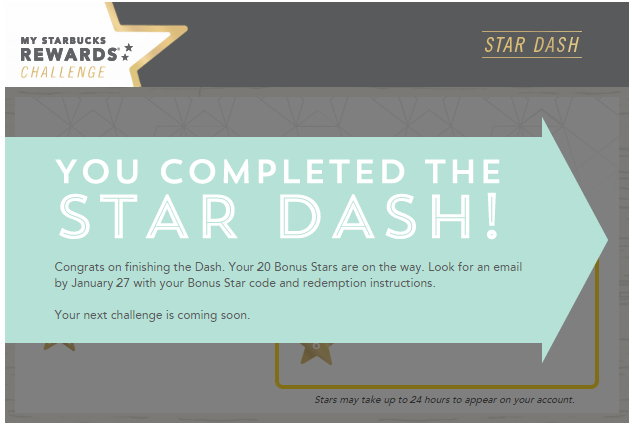 I know that there were several of you who were waiting anxiously for your email with the bonus code – including me! A friend commented that he had received his email yesterday so I was heartened, to say the least, that mine would be arriving soon. And sure enough, this was in my inbox this morning. Who knows what method Starbucks uses in sending out notifications but if you successfully completed the New Years Dash and the notification was in your Starbucks account, I would think that you can safely assume that your Bonus Stars code will be arriving soon. 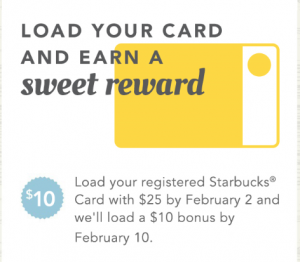 On another note, there are several people who have reported receiving a promotion where, if you load your card with $25, you will receive a bonus amount from Starbucks. One friend is reporting a $5.00 bonus and another is reporting a $10.00 bonus. Be sure to check your email carefully for either of these offers. Sadly, I haven’t received this one. 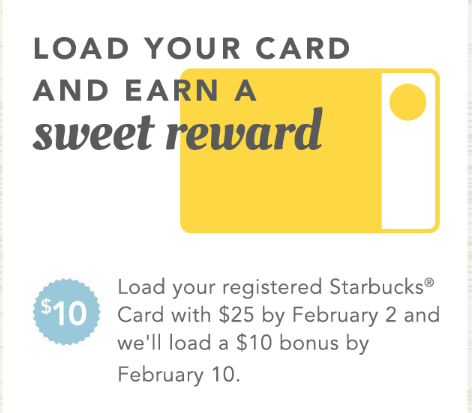 My latest bonus offer was simply for an extra star for the purchase of a handcrafted espresso. 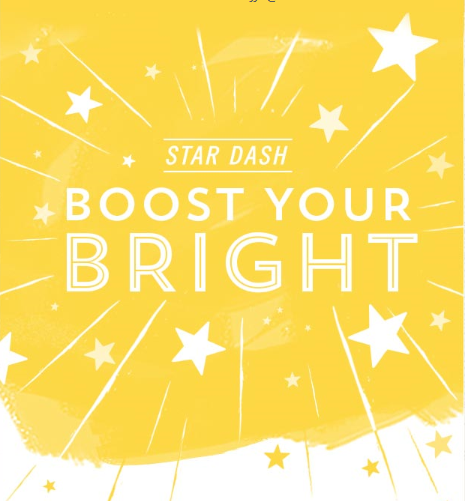 All Stars count towards that free drink or bakery item at Starbucks though. Remember: if you are purchasing more than one item, it always makes sense to pay for each item separately to get the best advantage from the offers. 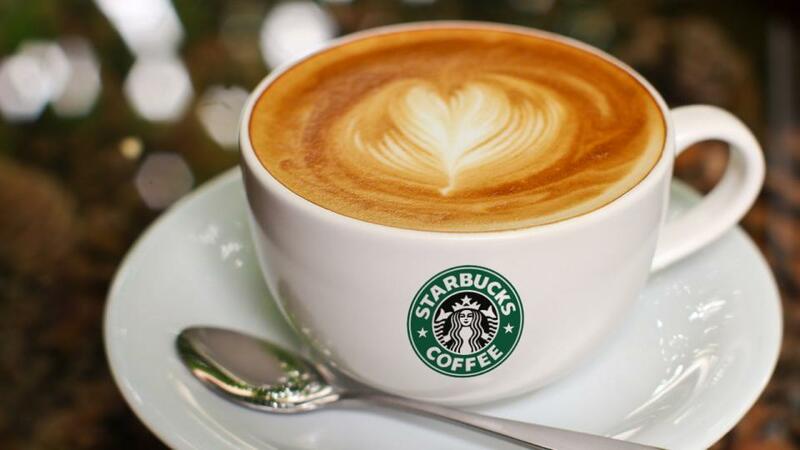 Of course, this rings true for any time you visit Starbucks. Separate transactions. Always. 3 Comments on "Starbucks New Years Dash Update and New Promo"
I think newbies sometimes tend to get the best offers. I have not received any offer for $5 or $10 if I reload the $25 to my card. My mom’s account, which has only been active for one month, did receive the $10 offer which we did take advantage of immediately. She did not, however, get the 20 bonus star dash perhaps because her account had not been active long enough when the emails were sent out. She received a recent offer for 3 to 5 days in a row with 3 to 5 bonus stars from January 20 to January 24. I’m not sure if longevity is the criteria for some of these. My friend who received not one but two $10 offers (two accounts) is a prolific Starbucks customer! 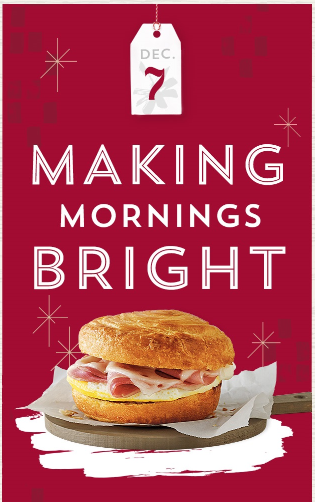 I got the 50% off Croissants offer on January 30th and the BOGO on breakfast sandwiches valid until February 2nd. I did not realize the Croissant offer was also for the Slow roasted ham crossant or I would used it yesterday but I did use the BOGO offer today. My mom did not get either offer in her account. Sometimes it seems like the newer members get better offers and this comes along and negates that. Maybe the offers truly are totally random among all the SB rewards members and there is no rhyme or reason to who gets what offer when.